These days, we’ll take our laughs where we can get them, including lawsuits between two abhorrent parties—like the legal battle between Kid Rock and Ringling Bros. and Barnum & Bailey Circus, who are having it out over naming rights. 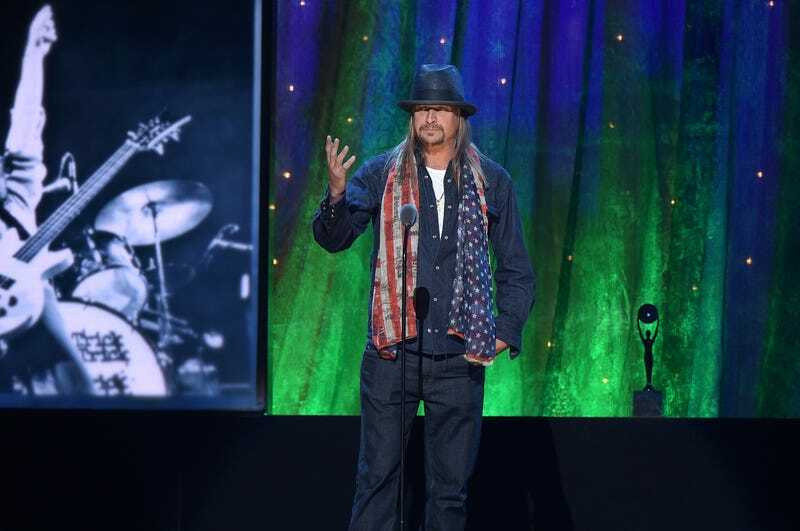 According to Stereogum, Kid Rock (real name Robert Ritchie) was all set to go on tour beginning this spring—unfortunately, that’s not the part that’s in dispute—under the auspices of “The Greatest Show On Earth,” which happens to be the name of one of his new tracks. But that “honor” has already been claimed by Ringling Bros. and Barnum & Bailey, as evidenced by decades of advertising. After learning that Rock intended to promote his onstage circus as the greatest show on Earth, the owners of the actual circus, Feld Entertainment, filed suit against him in December. Rock’s already blinked, dropping “the greatest show” moniker from his act, but not because he doesn’t think he has the right: “While I firmly believe that I am entitled under the First Amendment to name my Tour after my song, I have changed the Tour name because I do not want this lawsuit to distract me or my fans from focusing on what is important in my upcoming Tour—my music.” (Then maybe stop pretending to run for office?) The fight’s not over yet, though, because Rock is reportedly still planning to use the trademark in question on his tour merch. So the plaintiff’s attorneys are still seeking an injunction to prevent further confusion over what the greatest show on Earth is for anyone choosing between animal cruelty and a Kid Rock show.